Still more progress being made on the sponsorship front. 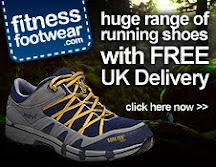 We are expecting a handful of North Face clothing as part of our sponsosrship, from Fitness Footwear, as well as a pair of North Face Hedgehog GTX XCR running shoes for trialing and testing. I had the pleasure of being interviewed yesterday by Martin Stew of Anglia News, who took a fair bit of footage of me running and at work, as well as a good interview (i hope). Still no date for transmission on the TV, but hopefully within the next week. Alex and i have been trying to sort our a Marketing Company who will help us "gratis" and may have found one (to be confirmed next time), and we are also now looking ot see if Cure Parkinsons Trust has a contact who can supply us with corporate sponsors clothing for TV appearances to advertise or sponsors. Plans are being drawn up for 2011 as well to run Lands End to John O'Groats (or the other way), but its early days and just in the planning stage. All for now - 1 Million Metres starts with one small step (of 25,000) on October 11th so keep following.